Having a set of Fingerprints at Home can Save your Child's Life. Rachel Donaldson, is a Forensic Scientist, Certified Latent Print Examiner. In other words, she is a real life CSI. Aware of the dangers facing missing children, she urges you to have your child fingerprinted. 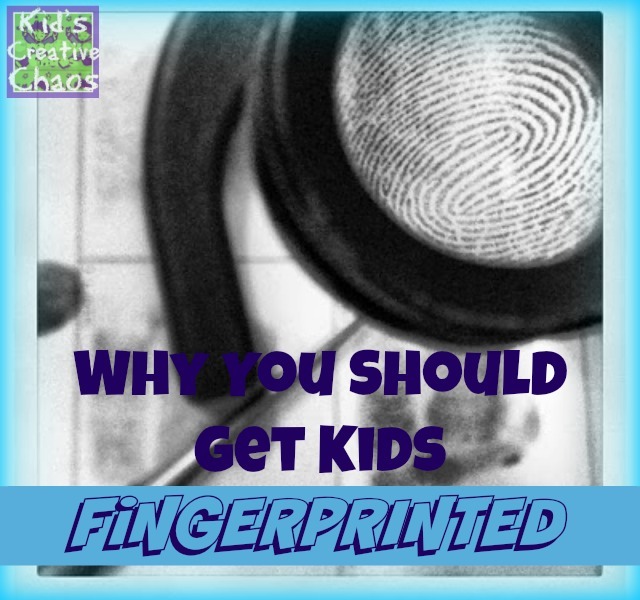 She tells us why it is important to get your child fingerprinted. Enjoy! It is important to get your kids fingerprinted. Picture this: you are in a shopping mall/ grocery store with your young child. You are distracted trying to find your size in the cutest top you've ever laid eyes on or you're trying to figure out if you have a coupon for the latest craze in health bars. You realize a couple minutes have passed and there have been no pulls on your shirttail or no sounds of "Mommy! Mommy! Come look!!" You look around in your general vicinity and your child is NOT THERE. He/she then pops out of the nearest clothing rack or comes back around from the cereal aisle. UGH. The whole scenario is enough to make your heart stop for a second or two. But, imagine your child wasn't playing around and had actually disappeared into thin air? I know, believe me, it's not something you even want to try to wrap your brain around, but we live in a crazy world and unfortunately it does happen. According to the National Center for Missing & Exploited Children, hundreds of thousands of children are reported missing every year, however a fraction of them are actually abducted by a "stranger". Because sometimes the macabre can occur, speaking as a fingerprint examiner for my city's local crime lab, I cannot stress enough the importance of having your child(ren)'s fingerprints (and DNA) at home. Fingerprints are unique to an individual and are permanent. Fingerprints are formed in 9-11 weeks gestation and do not change (except for growth) until decomposition. No two people have the same fingerprint--not even identical twins. Having a set of fingerprints at home could save your child's life. They could put a detective on the right track of a child abductor. Take for example a child is held hostage, disguised, and sent to school under a different name. If there was any suspicion, the child's prints could be acquired, compared, and hopefully identified to the "missing" child's fingerprints, IF and only IF there is a standard set available, or if your child's prints were found in a person's home/car where they were never supposed to have been. It could be a huge lead in getting your child home safely to you. In 2002, Danielle Van Dam, 7, was snatched from her own bedroom, while her parents slept. A suspected neighbor, David Westerfield, was later convicted of her murder after Danielle's fingerprint was identified to a print found by his bed. Tragically, in the Danielle Van Dam case, it was too late to bring her home. However, Danielle's fingerprints were found in her neighbor's RV. Her parents had no set of prints on her, but her mummified body had to be fingerprinted to allow for a comparison. It would have been much easier to have been able to have compared them to the standards at home. I urge you to contact your local police department, crime lab, etc to find information on where to get a fingerprint/DNA kit. Some police departments have Community Days where they will fingerprint/ swab your children. It could save a child's life--maybe YOUR child's life.